Willkommen, bienvenue, welcome to the most fun American Gods has had all season long. “Donar The Great” isn’t quite as, well, great as its burlesque strongman, but it’s nice to see American Gods return to its strengths. Split between the Regius Theater in pre-WWII Chicago and a mall somewhere in America (as the show’s captioning conceit would phrase it), “Donar The Great” tells us about Wednesday’s recent past—for an old god, anything less than a hundred years is very recent indeed—and about his lost son, and about a century of scrambling for relevance and reverence. As Wednesday—known here and now as Al Grimnir, owner and MC of the Regius—sings, his wide, wicked smile turns to a sneer, then a snarl under the lurid lights. “Donar The Great” tells you everything you need to know about Wednesday, about Odin, about the god who keeps Shadow Moon in his employ. Even on stage, he won’t hide his teeth, or pretend they aren’t sharp. Directed by Rachel Talalay (director of cult favorite Tank Girl, seven Doctor Who episodes, and let’s not blame her for South Of Hell), “Donar The Great” regains some of the series’ badly missed swagger. Even Ricky Whittle, who’s spent much of this season suspended in torture or sent off on side errands, gets in on the fun, resurrecting his Andy Haddock alias from “Head Full Of Snow” and giving him a heck of a promotion. Not everything in “Donar The Great” is as well fleshed out as that seamless scam. Back at the Regius (even its name, a variation on the more common theatrical name of Regis, draws attention to Odin’s presumption that he is royalty among gods), all the glitz distracts from the characters’ desperation… and also from the show’s occasional sloppiness. Laura Bell Bundy plays Columbia, symbol of America long before Uncle Sam or Lady Liberty, with the voice and verve of a Jean Harlow impersonator. “She sings, she dances,” Wednesday—Al Grimnir—tells the audience in his practiced patter, “but don’t be fooled, fellas, she can shoot the balls off a flea at 50 yards!” But for all her appeal, and despite the way Wednesday talks her up, Columbia gets short shrift, her power from a shoehorned-in strip number, her plans outwitted by a word from Wednesday. If we ever see Columbia again, this will have been an adequate (not scintillating) introduction to her. If not, she’s little more than a shiny distraction. Then there’s the shiniest distraction of all: Donar (Derek Theler), son of Odin, strongman for the Regius and their hottest ticket— “and not just with the ladies in our audience!” Indeed, with the appearance of Donar (an Old High German name for the Norse god of thunder), American Gods enthusiastically rebalances its recent indulgences of the male gaze, and how. It’s hard to critique Theler’s performance when Thor—I mean Donar, American Gods calls him Donar for, oh, some reason— is so passive and unreflective. Though the camera lavishes attention on his form and performance, Donar himself is barely more detailed than the background characters in the leather-jacket racket. Is that because writer Adria Lang intended to make direct comparison with those unconsidered victims of Odin’s scheme? Or because underserving supporting characters is the habit American Gods has fallen into lately? The answer will come only in future episodes, when we see whether the show (and writers) further probe Wednesday’s sorrow over his lost son, or whether the sacrifice of Donar is just a chance to shed some crocodile tears without killing off another established character. One thing Donar’s death does without compromise: It establishes a method of death from which there is no returning, even for gods. I expect that Chekhov’s gun (Odin’s spear?) to resurface in later chapters. 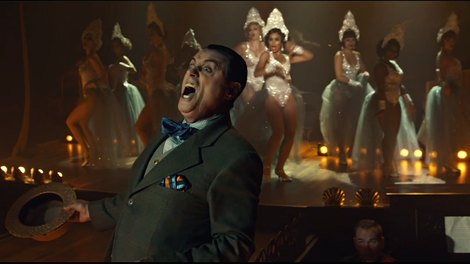 When I say American Gods is going full Cabaret, I don’t mean just the singing, the sequins, or even the welcome return of the show’s swagger. I’m talking about fresh-faced young Nazis who walk in mid-show, confidently surveying the dissolution around them. But the Friends Of New Germany, led by Manfred (Douglas Nyback), don’t want to shut down the burlesque. They want its strongman, its moneymaker. They want Odin’s son. And Odin wants to give his son to them. “Those jackbooted idiots will elevate you to your former glory,” he tells his boy, not caring what harm may come to the world or to Donar’s name—surely the one thing a neglected god must safeguard if he is ever to woo new worshippers—from this compact. For all its persuasively shabby glamour and undeniable fun, “Donar The Great” isn’t quite as effective as it could be. But more than any episode of the second season, “Donar The Great” shows Wednesday for what he is… and what he is is a gladhanding front man, an MC rousing the crowd’s appetite for glitzy exploits and a glimpse of flesh. What he is is a scammer, a man who’d sell his son to Nazis in exchange for greater worship, a theater owner who lies to his performers, a father who lies to his son, a gambler who would wager his greatest weapon and his son’s love in hopes of winning the big pot. In this episode, I see a glimmer of the swashbuckling sandbagger of a show that American Gods was in its first episodes, and glimpses of its old sentiment, too. As Wednesday sits alone on the Regius’ stage, warbling “Brother, Can You Spare A Dime” in an aging man’s voice with an aging man’s quaver, American Gods muddles the decades and the wars, but I can’t quibble. “Half a million boots went marching through hell/And I was the boy with the drum” is too fitting a line to lose over a little matter like a world war or two. It’s not divine, but in “Donar The Great,” American Gods has got its swagger back—and if not its spark, at least some of its sparkle. Technical Boy, tricked out in pre-war finery complete with an ejector-style cigarette holder, swallows orders issuing from the Regius’ cutting-edge tabletop telephone, while on stage a performer swallows fire and spits it back out. I love the idea of “an artifact of great power” revealed to be Lou Reed’s leather jacket. But a typical mall (and everything in “Donar The Great” suggests that this is a large, maybe even legendary, but otherwise typical mall) is full of row after row of identical mass-produced goods, each item indistinguishable from its neighbor, not uniquely sentimental objects of peculiar and well-documented provenance. Brother, can you spare a click? Contributor, The A.V. Club. Emily L. Stephens writes about film, television, entertaining, gender, and cake. A lot about cake, really.